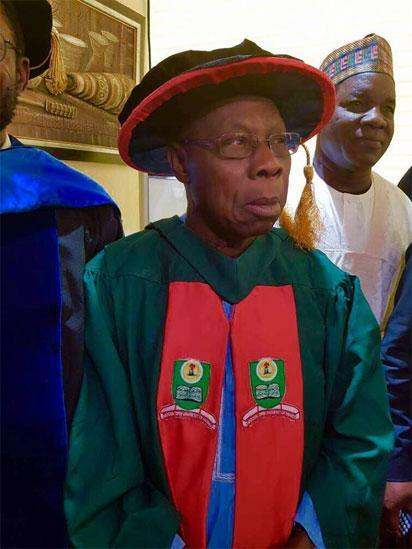 Obasanjo, Gov. Ahmed, Dabiri-Erewa, others to attend investment forum in U.S.
New York – Nigeria’s former President Olusegun Obasanjo, Gov. Abdulfatah Ahmed of Kwara and former Anambra Governor Peter Obi, among others, would be among dignitaries to attend the 2018 Nigerian American Business Forum in Florida, U.S.A. on Saturday. Shobola said the primary objective of the forum is to foster a safer investment environment for entrepreneurial business in Nigeria from the Diaspora and the globe. “We also intend to bring into Nigeria the much-needed investments in key areas of the economy that will enable rapid growth such that will set the country at par with other advanced economies globally. “The Nigerian American Business Forum (NABF) is a business forum that constitutes the very best of Nigerian professionals and entrepreneurs in America. “It serve as a major conduit for interfacing with both the Nigerian private and public sector,” Shobola said. He said this was being achieved through the interface of both Nigerian private and public sectors with the entrepreneurial and professional disciplines of the members of NABF. “The Forum provides a platform where American-based Nigerian professionals and business owners can effectively interact with NABF members and entities at the highest levels of government and the private sector. “This is for the mitigation of pitfalls and challenges in business execution in respective regions of Nigeria. “The relationships built within this forum are expected to translate into increased opportunities for inward investment in Nigeria and upward opportunity for its members into American sectors. “Members of the forum will rally their expertise and resources to help other members mitigate risk and foster safer investment strategies into high yield return sectors in Nigerian and American economies,” he said. The post Obasanjo, Gov. Ahmed, Dabiri-Erewa, others to attend investment forum in U.S. appeared first on Vanguard News. Previous FOR MEN: 3 Fruits That Helps Boost Erection and Last Upto 40 Minutes During S3x.